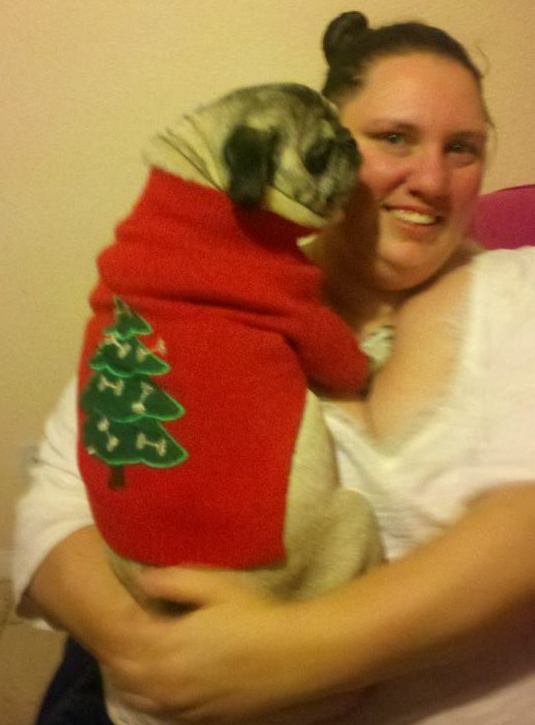 Biscuit the Pug and I wish happy, body positive, holidays to all who are celebrating, and a happy, body positive, week to those who aren’t! One of the most frequent questions I get during the holidays is about how to deal with family who are behaving badly. I’ve heard from a number of people who have done this and the common thread seems to be that they only had to do it one time and then their families started respecting their boundaries. Of course your mileage may vary. I’ve written about dealing with the Family and Friends Food Police and Combating Holiday Weight Shame, but today I thought I would do it in song. To serve as a reminder, I’ve re-written the lyrics to “Oh Christmas Tree” to be an ode to boundary setting, and the post is now a Dances With Fat tradition. Next ›But What Will People Think? My family would not only allow me to leave, they would refuse to invite me to other gatherings afterward. They believe it is their duty to monitor my weight in the guise of addressing it as ‘health concerns’ My solution was to ignore their picking and eat as I pleased, which proves to be Less than everyone else, including my pencil thin sister and niece. That’s horrible Maureen. I’m sorry your family is like that and I hope you have a great holiday anyway! I love the song! Merry Christmas and may your holidays be fat shaming free. This song gives me gleeful giggles every year. Thanks for posting it again! Biscuit! The beautiful Fat Chick! The cool and wonderful song!! Cuteness and apropos snarkiness! My cup runneth over! Even if you got into a debate and showed them studies, they might then counter said studies with their ones of own, or use the word “denial”. Just a few thoughts from a fat woman. I don’t usually get body shamed directly when around relatives, but a fit step-brother will almost inevitably talk about exercise, foods he eats/”should” be eaten to be healthy, and sometimes how to “get rid of fat around here (belly)”, for lack of exact wording. When taking a trip to see step-siblings 3ish weeks ago, the fit one demonstrated an exercise he called “planking” (not the fad in which people lie straight on objects). Yak, yak, yak is what he did about fitness, while I’m wondering if he’s mentally fit, since he seems to get his self-worth from his fitness level (I could be wrong). Nadja! I thought I was looking at myself many years younger!!!!! I have the same wall hanging with votives, same style glasses and similar cute button nose. I also wear my hair short and tosseled. lol. Biggest difference is I’m no way soprano. We should figure out a way to harmonize someday. Great job! Loved both versions, posted. My biggest challenge will be helping my daughter not food police or fat shame herself openly at the holiday dinner.